Any quirky tour of Brazilian pop culture that I have already embarked upon will inevitable at some point in time need to jump off at the bus stop marked “Vai Que Cola”. I have had various conversations with Maria on how to translate this phrase, and maybe it is something like “Let’s hope it all works out fine”. Well in terms of this article – Vai Que Cola! I know things can be a little deep sometimes on Transtion Consciousness, and I have after all just written about Hans-Georg Gadamer’s philosophical masterpiece on hermeneutics Truth and Method. But hermeneutical analysis applies not just to obscure historical texts which are only of interest to fusty professors, but also to silly things too. Having already written about the asurdist comedy of Porta dos Fundos, I now need to turn my attention to this really quite remarkable ensemble piece which has no real comparable analog in UK television. 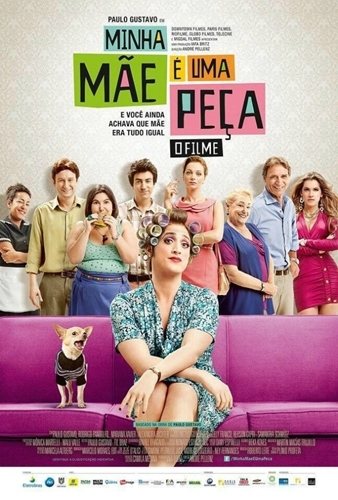 Vai Que Cola is a sitcom which launched last year and is now in its second series. 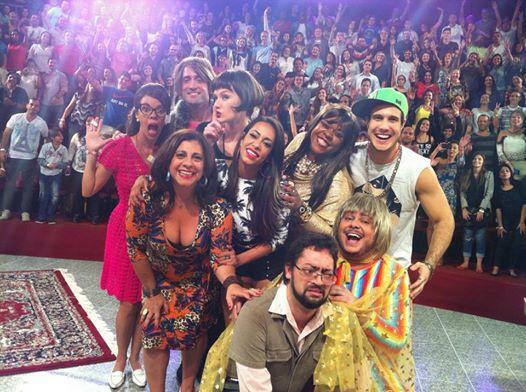 Each series has no less than forty episodes, with new episodes being broadcast daily on the Multishow channel. With over eleven million viewers, it is the programme with the largest audience on paid tv in the last ten years in Brazil. But how to explain? The situation of the comedy is that all the action takes place in the pension of Dona Jô, played by Catarina Abdala. I am not too sure how to translate pension as we don’t really have them in the UK, but it is a kind of guest house with semi-permanent lodgers. The cast, as you will see in the first picture, reads like a Who’s Who of Brazilian comedy, with many also taking part in Porta Dos Fundos. Voa Que Cola is filmed in front of a live tv audience, and although of course this concept is nothing new, what is amazing is to see the level of interaction between the comedians and audience. This begins with the entrance each night of each character, most of whom enter on their own to rapt applause. It can get quite intense. 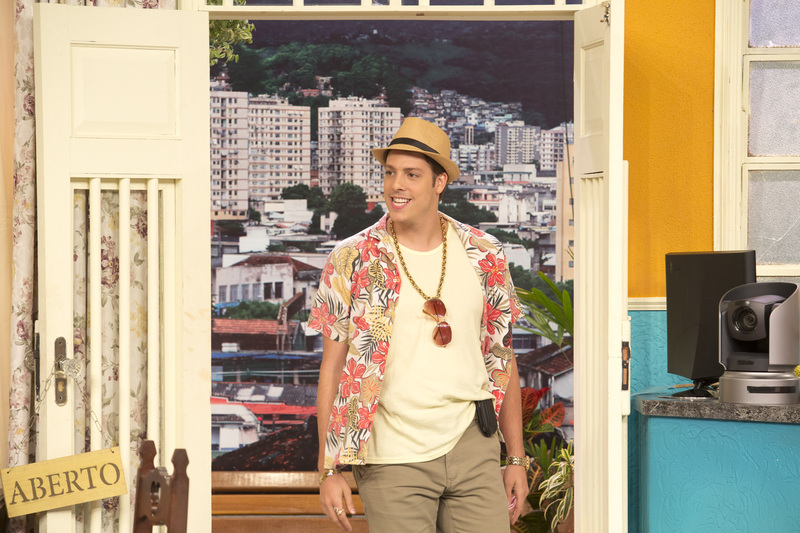 For example, Marcelo Medici, who I have already written about in his excellent comedic portrayal of Joel in Joia Rara, plays Sanderson, a quite realistic Corinthian supporter who has come to Rio de Janiero, and the last time I saw him come on stage a small group of Corinthian fans in the audience went a bit wild and launched into a ridiculously intense chant for their team. I am not entirely too sure they realised that Sanderson was a character and not an actual real person, such was their connection. Vai Que Cola is not a subtle comedy, with some extremely larger-than-life characters, such as Fernando (“I’m a concierge not a janitor!”) played by the hugely enjoyable Marcus Majella, the motormouthed Lindinha, played by Cacau Protásio (who was also in Joia Rara), the hyperactive Jéssica and her more lackadaisical boyfriend Máicol played by the brilliant Samantha Schutz and and Emiliano D’Ávila, and of course Valdo played by Paulo Gustavo. I mentioned Paulo Gustavo briefly in my piece on Porta dos Fundos. He seems to be omnipresent on Brazilian television, and like Fabio Porchat, has a work ethic which appears to defy the space-time continuum. In 2006 he appeared in a self-penned play Minha Mãe é Uma Peça which could be translated I think as My Mother is One of a Kind. I was watching an interview with Gustavo, and if I understood correctly, this play has not stopped with Gustavo performing every weekend for packed audiences. This play was recently turned into a film, and I swear Gustavo turned out a Grammy or Oscar winning performance in which he plays a harried mother Dona Hermínia, a character inspired in a large part on his own mother. If I mention Gustavo in detail, it is because he is the largest star of the show. However, for me the show is eminently watchable because as I said at the start, it is truly an authentic ensemble. The is written by Leandro Soares and directed by César Rodrigues and João Fonseca. While Gustavo is a huge celebrity and star, when watching it is as if each and every actor manages extremely successfully to leave their personal egos behind, and you can not really sense any kind of hierarchy, either personally between the celebrities, or in relation to the comedy in which no single character dominates. In addition to this dynamic, when watching there is another dynamic which also to me appears natural, authentic and improvised, as opposed to cynically written in. It seems that the combination of the number of episodes together with the intense workloads of many of the cast mean that lines are fairly regularly fluffed, forgotten and generally messed up. Although it does seem that many scenes are refilmed, since we see the bloopers at the end, many are left in. In one scene, Gustavo was trying to get through quite a long monologue while sitting on his bed, and eventually just gave up and speaking to no-one in particular just asked to stop there and move on to the next scene. The audience love it. There is a wonderful comedic chemistry between the cast, and as well as messing up lines, it is refreshing to see them really enjoying themselves so much. Pretty much every show, the punch lines are so funny, or the accents so silly, that they make each other laugh, and sometimes struggle to really keep a straight face through their scenes. This is of course more opportunity to connect with the audience. Really, when Maria and I watch, I really think that this is one show where everyone totally seems to be absolutely having a blast recording it. It’s a show where you think it must be absolutely amazing to be a part of, and I just wish I had even a modicum of comedy talent that these guys have. I really am not very funny English, and pretty much non-existent in Portuguese, although a few months ago I did manage to summon up one witticism which raised a modest smile in Maria. 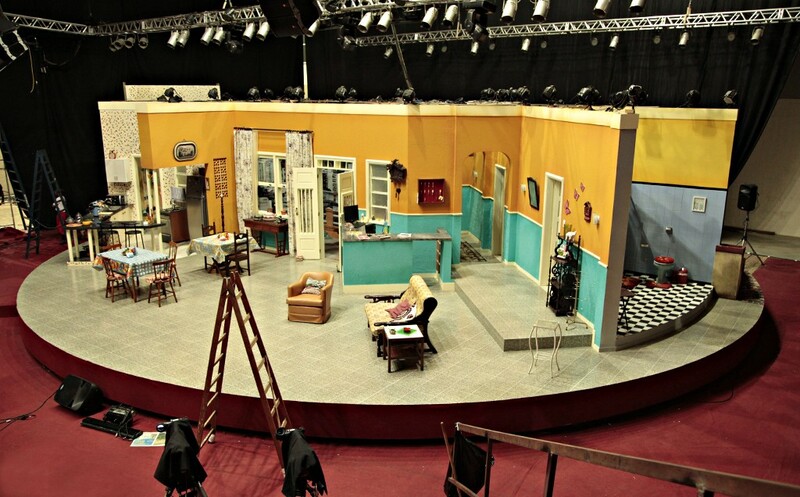 While most of the scenes are centred around the open-plan kitchen and living room of the pension, the stage is circular and it rotates. This happens in real time, and so when one scene comes to a close, the stage starts to rotate to a bedroom or the backyard. There are sometimes these little tiny random skits with one or two actors for example miming out a scene maybe at the front porch or bathroom which are slithers of the circular set. I am not too sure if I have explained this clearly, but it shows an attention to detail in the audience experience of the rotation of the stage. I have not mentioned every single character and comedian who form part of this delicious ensemble (take a bow Tatá Werneck, Júlia Rabello, Fernando Caruso, Fiorella Mattheis and Sílvio Guindane) and there are also occasional characters, one-off appearances such as the lunatic loan shark played by Fabio Porchat, and special guests too. If I am honest, sometimes the plots never seem to quite be tidily resolved in the end, often descending into confusion, but more often than not fancy dress and a group dance. And a selfie. The show always ends with a group selfie which we are always shown. It’s interesting as next week, Porta dos Fundos moves from its home on the internet to Fox. 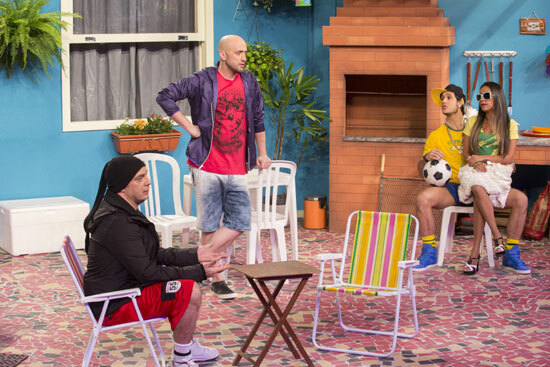 Multishow has been dominating Brazilian television comedy for some time now, with other shows such as Paulo Gustavo’s 220 Volts. Fox it would appear is low down in terms of ratings, so it will be interesting to see how these two giants of Brazilian comedy play out. Vai que cola, né?